With Philips' HeartStart Trainer; CPR and first aid instructors can help empower their students with awareness of HeartStart Defibrillators and how to use them to save lives. The HeartStart Trainer simulates how the HeartStart OnSite and HeartStart Home Defibrillators will operate during a real-life sudden cardiac arrest event. Clear, confident voice instructions provide easy-to-follow directions and eight pre-configured scenarios to make training easy and more rewarding. 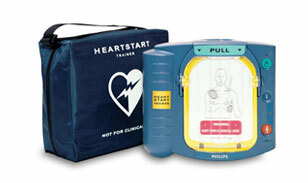 For safety, the HeartStart Trainer is sufficiently different to avoid inadvertent use in an emergency.